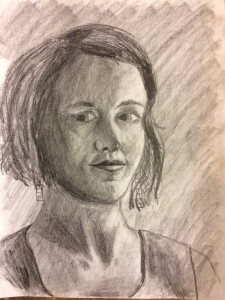 I am wrapping up the drawing unit with my Art 1 students, and the last assignment is a self portrait. Most people shrink in fear when they think of drawing a self portrait. The self criticism that it evokes can be incredibly stressful for anyone that is not a professional artist. In a room of teenagers this is even more evident. Students are insecure about their looks, insecure about their drawing abilities (most of them, anyway) and will employ any number of strategies in order to avoid doing the portrait. Going to the bathroom for long stretches, taking the whole class to tone their paper, starting over, and over and over. Adults use different forms of strategies. They simply don’t do it at all. ‘I can’t draw!’ ‘I am not an artist’ or ‘I can’t draw a straight line with a ruler’ are all things I have heard people say. Who has a straight line on their face? I don’t like doing self portraits either. It is not my favorite thing. ‘Do I really look like that?’ I inevitably think as I really study my own face. I also feel insecure doing a self portrait in front of the room full of teenagers, who in order to shield their own insecurity will be critical and mean. However it is a challenge that I can’t turn down. You know whether it is done well or not. It is easy to tell if the drawing looks like you or not. I have done a lot of portraits that I was not super proud of. Like any other skill if you practice enough you will get better. My most recent portrait was my best yet. My advice if you want to jump in to learning the art of drawing is to get the book: Drawing on the Right Side of the Brain by Betty Edwards. There are a number of exercises to lead you through different drawing skills. Many people think that you are either born good at drawing or not, and that’s it. I know that is not true. You can learn how to draw. Just like anything else. Good luck on your creative endeavors.